UPDATE: While I’m already half way through the much recommended book by Zed A. Shaw – Learn Python The Hard Way, I’m still doing my research on other great resources to help me get started with Python. This page listing 10 Python blogs worth following, in particular emphasizes Mouse vs python to be the most useful. Starting the 10th of June, I’ll be engaged on a 9-week-long MOOC on Computer Science using Python, offered by MIT. 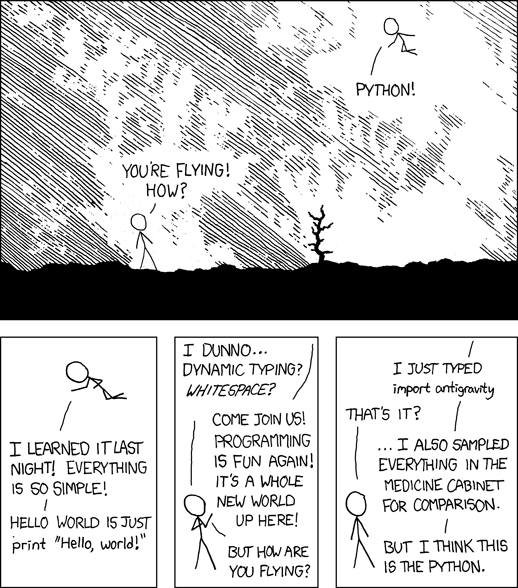 and voila, you are redirected to this telling XKCD tale of Cueball performing gravity-defying stunts with Python.